There are two types of people in this world: those who like sweet breakfasts, and those who like savory breakfasts. The latter prefers to leave the cavities and the inevitable sugar crash to the former. Around the world, savory breakfasts are generally more prevalent than sweet, and even the countries with the best sweet breakfasts can’t compete with the best savory breakfast traditions. These are the best countries for savory breakfast lovers. Breakfast in Korea is something of a fluid concept. The general rule of thumb is that if it’s being cooked in the morning, it’s breakfast. Which is perfect for people who can eat lunch and dinner all day long. Expect rice and a mouth-watering array of banchan (various side dishes to go with the rice) like cold cucumber soup, galbi (grilled short rib), stewed fish, pickled veggies, kimchi, and seasoned kelp. 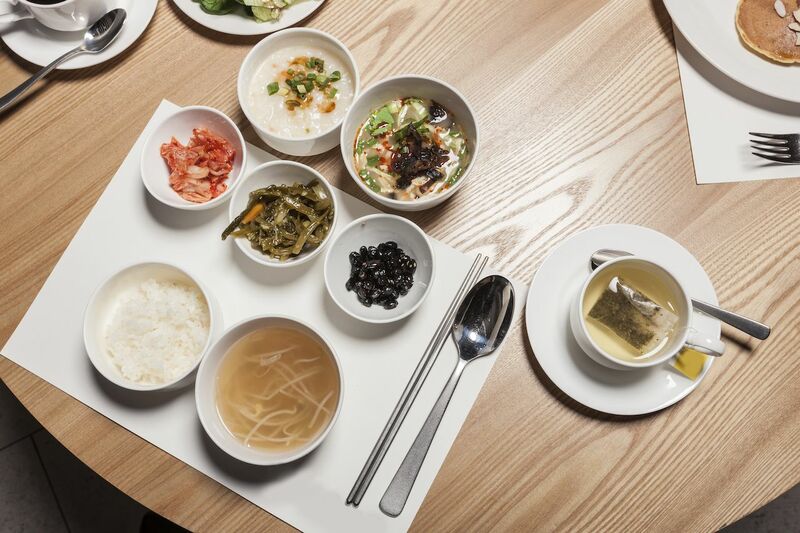 Traditional Korean food is one of the healthiest cuisines in the world, and the balanced breakfast is part of the reason why. For people in need of a quick breakfast fix, street vendors serve up a Korean take on the breakfast sandwich called gaeran tost-u, which is a toasted egg sandwich with cabbage and topped with a generous sprinkling of brown sugar. Sweet. Salty. Perfection. Turkey has the best breakfast in the world, hands down. The country doesn’t mess around when it comes to the first meal of the day. On an average weekday in Turkey, expect to tuck into a mini buffet of seeded bread, olives, cheese, butter, honey, jam, freshly sliced cucumbers and tomatoes, and boiled eggs or an omelette. The weekend is when things really kick off, though, when bowls of hot sucuk (dried Turkish sausage) and menemen (a dish of finely sliced tomatoes mixed together with green peppers, onion, olive oil, and eggs) often make an appearance. Some cafes and restaurants also serve börek, which is a thin sheet of dough stuffed with cheese, meat and/or veggies, and is then baked until flaky. 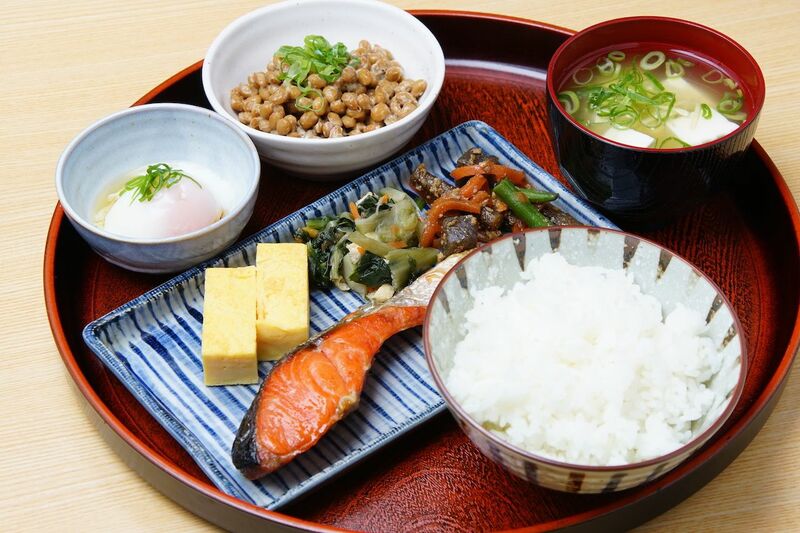 In Japan, breakfast starts with rice. Then any of the following is added: miso soup, a raw egg mixed with soy sauce, fermented soybeans, akoten (crisp-fried fish), nori tsukudani (blended seaweed paste), and as many pickles as you can get your hands on. All of that falls under the category of traditional breakfasts. These days, most working people simply go for quick piece of toast, cereal or pancakes, or a donut and hot coffee to go. No one would ever suggest that the famed full English breakfast is by any means healthy. 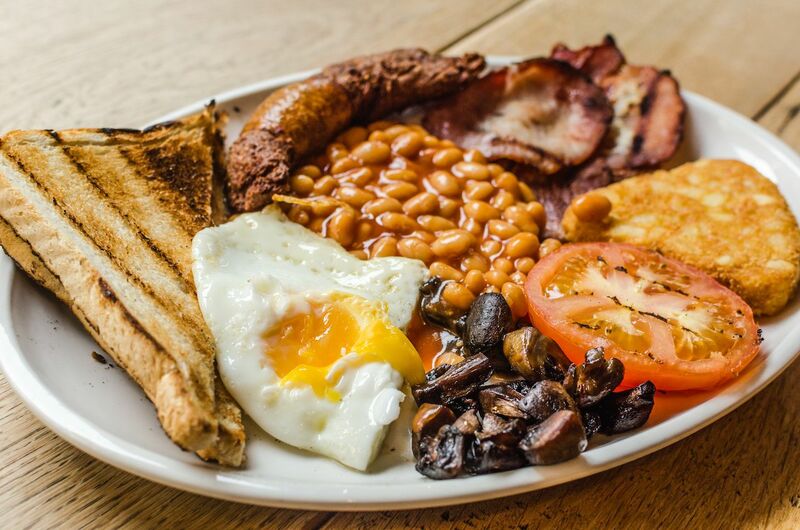 But when it comes to a hearty start to the day, it’s hard to beat all that’s offered in the UK. The traditional full English includes thickly cut bacon, sausages, fried eggs (or poached if you’re posh), fried mushrooms, grilled or fried tomato, buttered or fried toast, black pudding, baked beans, and, sometimes, bubble and squeak (fried mashed potato and cabbage). It’s all washed down with a cup of tea or coffee. Different regions have their own take. In Scotland, it’s called the full Scottish and the bread is replaced with grilled oatcakes and occasionally haggis, tattie scones (griddle-fried potato cakes), and white pudding. In Ireland, the full Irish has hash browns, potato bread, or boxty (potato mash pancakes) on your plate. The Northern Irish take things up a notch with their famed ulster fry, which features the addition of soda bread (a flat bread which is fried until crispy and golden) and vegetable roll, which is made out of minced beef, not vegetables. You have to kick your diet to the curb when eating breakfast in Bulgaria. Think hot milk-soaked bread laced with butter and sugar, and deep-fried dough served with lashings of cheese. 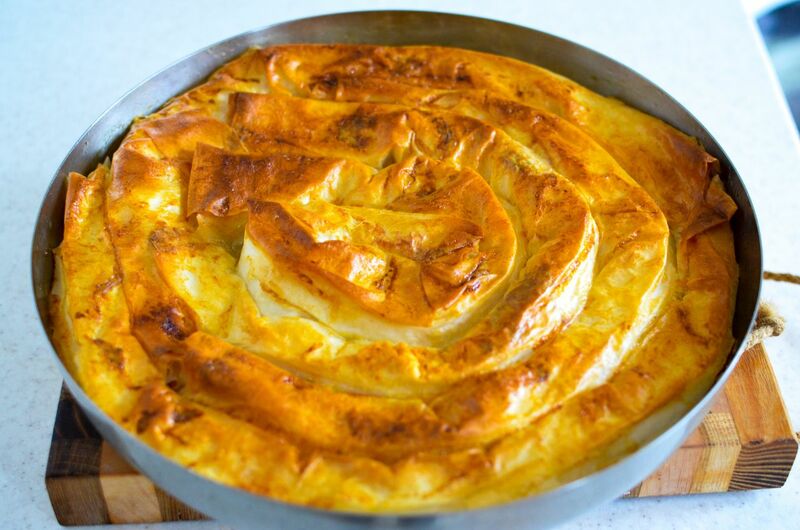 And you can’t forget the jewel in the Bulgarian breakfast crown: banitza, a traditional dish made from layers of egg-soaked filo pastry that’s baked to crispy perfection. It can be enjoyed hot or cold, eaten as the star of the show or paired up with cool yogurt and washed down with boza, a traditional fermented malt drink made from maize corn. 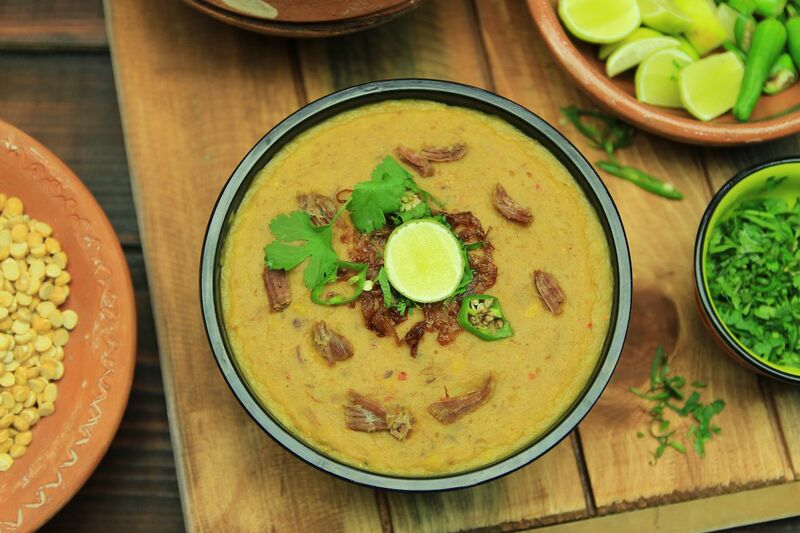 Haleem — the go-to morning meal in Iran — sounds simple, but it packs some serious flavor. It’s essentially meat and wheat that’s cooked, blended, seasoned, and served in hot bowls topped with mint leaves, lemon juice, ginger, fried onions, and chillies. Scoop it up with naan or pad it out with hot rice and you’ll be stuffed until lunch. It’s notoriously tricky (not to mention time consuming) to make, so be sure to compliment the chef if you’re lucky enough to find this on your morning menu. Cachapas is the Spanish word for “crumpets,” and this version is the number one breakfast snack in Venezuela. It’s essentially a dough made from fresh ground corn, which is then rolled into thick pancakes and fried on a flat grill called a budare. In one variation, the dough is packed into dry corn leaves and boiled. Look for cachapa de hoja on the menu if you want to try this version. 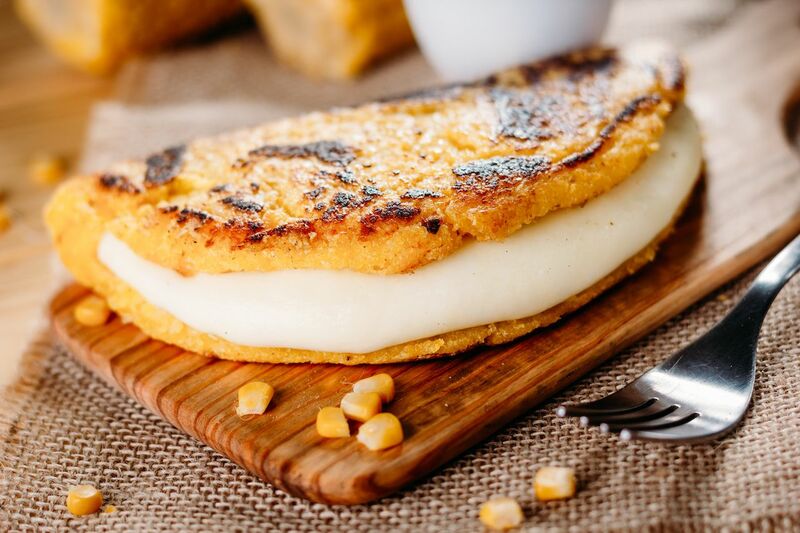 Cachapas are traditionally paired with a soft, white, mozzarella-like cheese known as queso de mano, though it’s not uncommon to see more elaborate concoctions topped with crispy fried pork, cream, or jam. 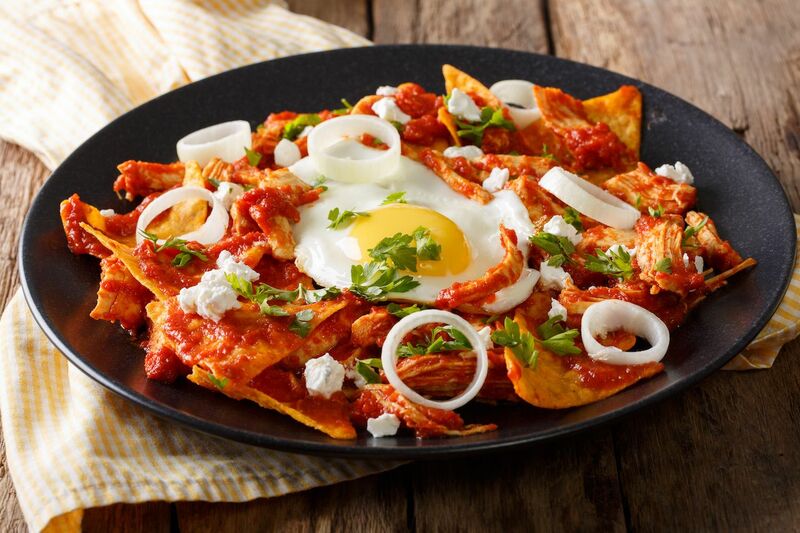 Chilaquiles are the ultimate Mexican comfort food. It began life as a thrifty way to use up stale tortillas, which were cut into strips and simmered in salsa until soft and then soaked in spicy goodness. The dish varies slightly from region to region. In central Mexico, the salsa is poured on last minute so the tortillas keep their crunch. In other regions, your salsa may be spicy red or creamy green mole. It’s usually served with a side of refried beans, although more lavish versions are available with melted cheese, eggs, veggies, pork, or lamb. 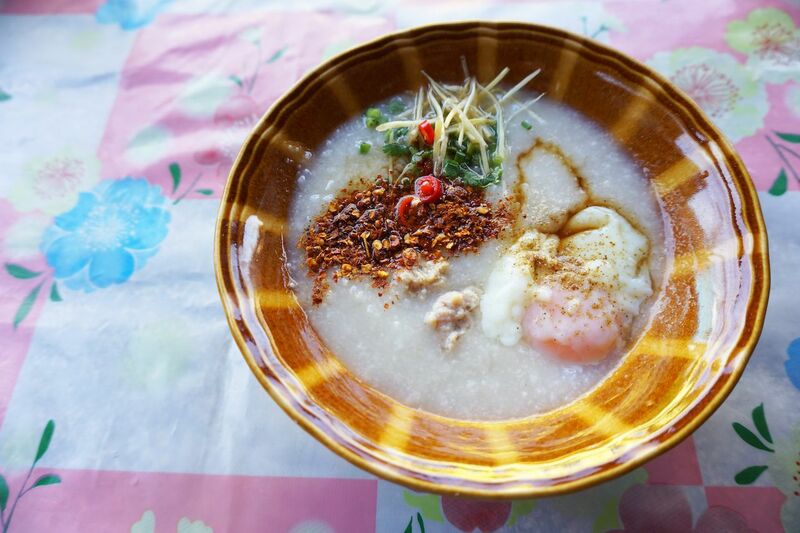 One of Thailand’s most popular breakfast foods is jok, which is essentially a rice congee, or porridge, that can be found throughout Southeast Asia. In Thailand, it’s traditionally served with a raw egg plopped in the middle and topped with an assortment of tasty extras like minced pork or beef, fresh spring onions, fried garlic, sliced ginger, pickled radish, and patongko (a stick of crispy fried dough). Although popular in the morning, you can find eateries serving it throughout the day, sometimes plain with an assortment of tempting sides to go with it. 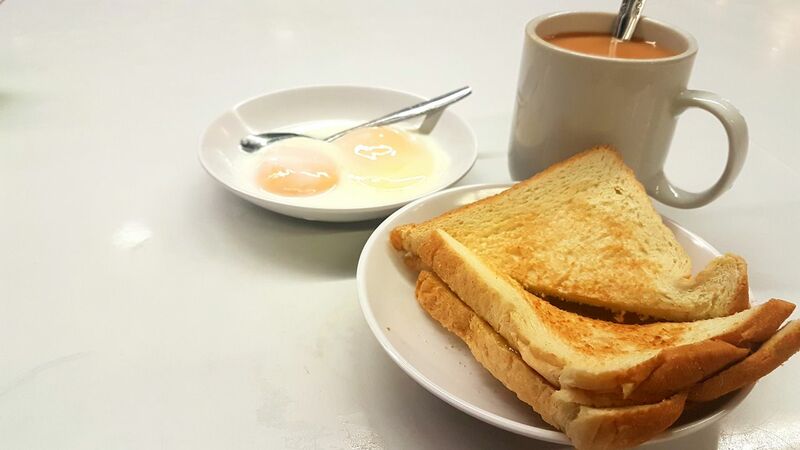 What’s a typical Singaporean breakfast? Trick question! In Singapore, breakfast doesn’t differ much from lunch and dinner. Popular options include stir-fried noodles, noodle broth, and rice porridge. But if we’re going to award one dish the title of national breakfast, it’s kaya toast. The crispy toast is topped with a thick layer of sweet pandan-scented coconut custard, soft-cooked eggs, white pepper, and soy sauce. Eat it with a steaming cup of hainanese kopi (black coffee laced with a generous dollop of butter) and you’re ready to roll.